Rio Grande Outfitting is a small family oriented operation that focuses on quality over quantity. They only have a few hunters in camp at any one time and this allows them to provide the client with exceptional attention. 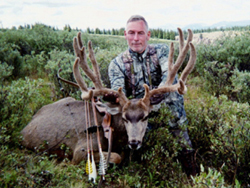 Through the years, their knowledge and experience in the areas they hunt have made it so that they can maintain a very high hunter success rate which is much higher than the state average. 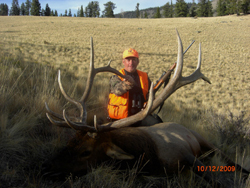 Rio Grande Outfittings main focus is on elk, but being so close to the famed Gunnison Basin makes for some awesome deer hunting as well. They are also able to offer the lucky hunter that has drawn a bighorn sheep or moose tag their first class personalized service as well. 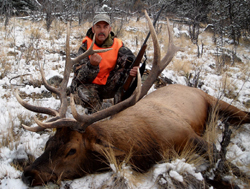 Rio Grande Outfitting operates their Elk, Deer, and Moose hunting within the boundaries of unit 76. This is also unit 9 for bighorn sheep. Their camps are accessed via horseback and are very comfortable. These camps are all within easy striking distance of the species your are pursuing. Whether you will be hunting early in the season or after the snow flies in the late season, Ash is able to provide you with the services you need. Check out their website at Rio Grande Outfitting or contact Hunters Trailhead for more details.